The road to WrestleMania officially began after Royal Rumble, and the fans are excited for the biggest wrestling carnival of the year. The storylines are gradually progressing for the Grandest Stage of Them All, as Seth Rollins won the men's Royal Rumble match and Becky Lynch won the women's Royal Rumble match. Since Becky was victorious at Royal Rumble, she challenged the Raw women's champion Ronda Rousey, but Charlotte Flair replaced the Man. The scenario is likely to alter, and Becky Lynch is expected to be added to the Raw women's championship match. Moreover, she earned the right to headline WrestleMania 35 when she won the women's Royal Rumble match. Lynch made a surprise appearance at Royal Rumble despite being suspended for sixty days. As a matter of fact, she attacked the Raw women's champion Ronda Rousey and the challenger Charlotte Flair. Ronda was busted open after Lynch assaulted the current Raw women's champion. The three women had a face-off in the squared circle at Elimination Chamber, and it suggests the Raw women's championship match will be a triple threat match in New Jersey. The match has been building up well and it could main event WrestleMania 35. Here we discuss three reasons why Beck Lynch should be added to Raw women's championship match at the Grandest Stage of Them All. Ronda Rousey made her in-ring debut last year at WrestleMania 34. She won the Raw women's title last year, and she faced several superstars of the women's division. Since Becky Lynch was part of the Smackdown Live, Rousey never faced the Man. Hence, it could to be a fresh rivalry for the WWE Universe if Lynch gets added to match and faces the current Raw women's champion. Lynch and Rousey were scheduled to face each other last year at Survivor Series, but Lynch was removed from the match after getting injured by Nia Jax. In fact, Lynch's replacement was Charlotte Flair at Survivor Series. The build-up for the match was remarkable, but Lynch's unfortunate injury prevented the bout. 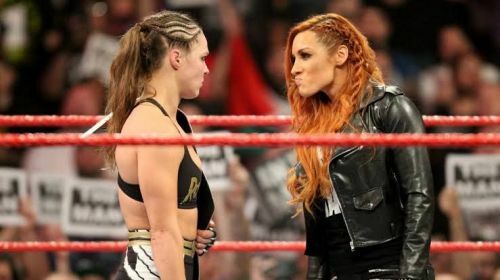 Though Lynch and Rousey will not have a one-on-one bout at WrestleMania 35, they could still put hands on each other in a triple threat match. Regardless of the result of the match in New Jersey, they could continue the rivalry after WrestleMania 35.